Too often we talk about art as the product of independent genius. The artist, as mythical figure, toils alone in their studio to weave a golden thread of creativity into a magnificent oeuvre. In only the rarest, most tragic instances is this true. Most artists, and in particular most great artists, surround themselves with smart, intuitive, thoughtful people with whom they engage on a regular basis. Good art is inherently social and the production of art is a community-based activity. 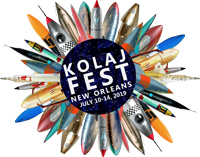 This editorial originally appeared in Kolaj #19. 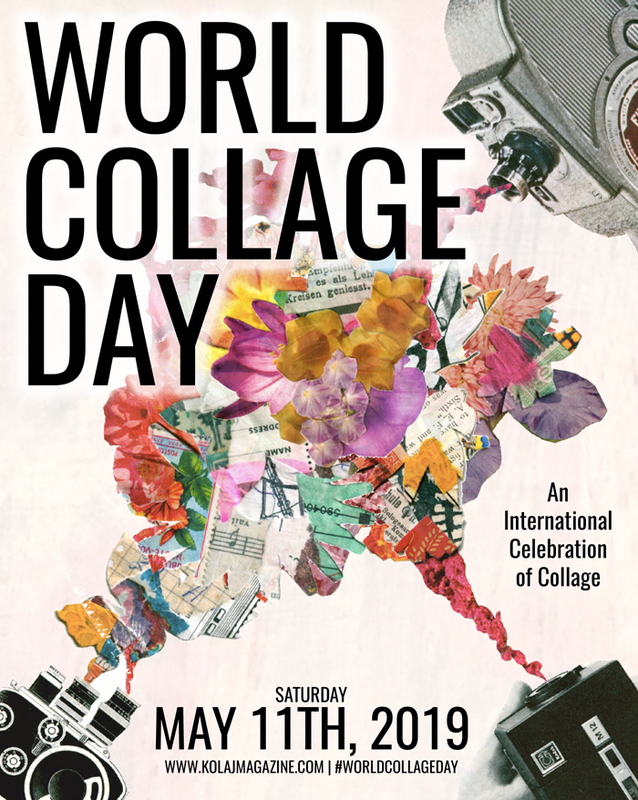 For more news from the world of collage, Subscribe or Get a Copy of the print magazine. This mythology carries over to how we show art. The solo exhibition, the retrospective, is the art world’s way of announcing that an artist has achieved some standing. It signals that a gallery believes enough in an individual artist that they are willing to invest a month’s worth of rent, utilities, and staffing. Critics are biased towards covering a solo show and use it to frame an artist for their reader, to tell the story of the artist’s evolution, process, or journey. Rarely do we acknowledge the professors, friends, family, benefactors, professional peers, mentors, occasional acquaintances, and drinking buddies, all of whom, in small (and sometimes large) ways contribute to the artist’s efforts. If it takes a village to raise a child, it certainly takes a village to make good art. Rarely do we acknowledge the professors, friends, family, benefactors, professional peers, mentors, occasional acquaintances, and drinking buddies, all of whom, in small (and sometimes large) ways contribute to the artist’s efforts. Astute viewers can tell when an artist is too isolated. The art becomes idiosyncratic, self-involved. The visual language becomes a sort of cryptophasia, understandable only to the artist and their inner self. Certainly, there are times when aesthetics and mystery mingle to make savant-like output and the art world is more than willing to indulge such characters, but more often than not, such endeavours are fueled more by bravado, flash, and ego (and some good marketing) than meaningful artwork that speaks to and moves other people. 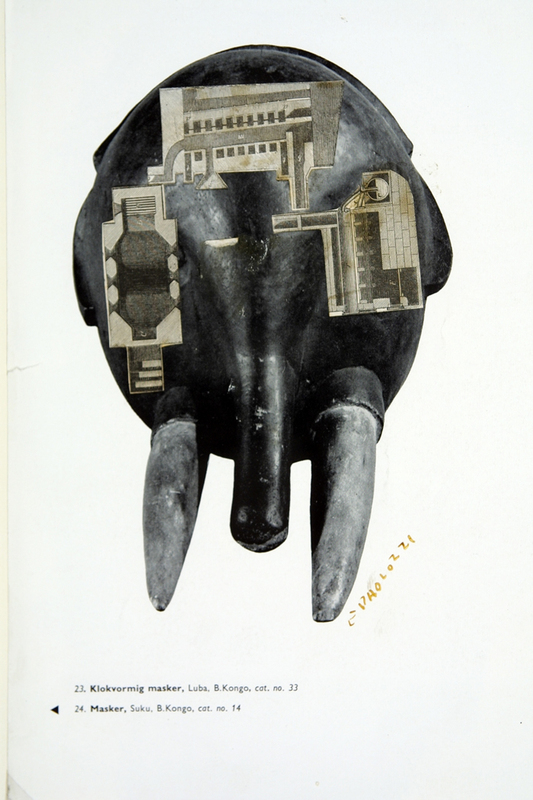 Eduardo Paolozzi, whose retrospective at Whitechapel Gallery is discussed in this issue, reminded me of all this. Whitechapel offers a brilliant exhibition and reflection on this important 20th century artist whose work went a long way to legitimizing collage as a valid, contemporary medium. Throughout Paolozzi’s life, he worked in community with other artists, writers, and thinkers. In Paris in the late 1940s, he spent time with Alberto Giacometti, Jean Arp, Constantin Brancusi, Georges Braque and Fernand Léger. On returning to London, he chose Chelsea, that influential borough of artists, as the location for his studio. In 1952, he, along with others, founded The Independent Group and organized exhibitions with artists working in diverse array of media: Richard Hamilton, Toni del Renzio, William Turnbull, Nigel Henderson and John McHale. He taught sculpture and ceramics at institutions that gave him access to academic communities. Paolozzi engaged, corresponded with, and lifted up other artists. We can choose to see the body of art he left behind as one man’s product or we can choose to see it as one man’s ability to build a community of people around him. 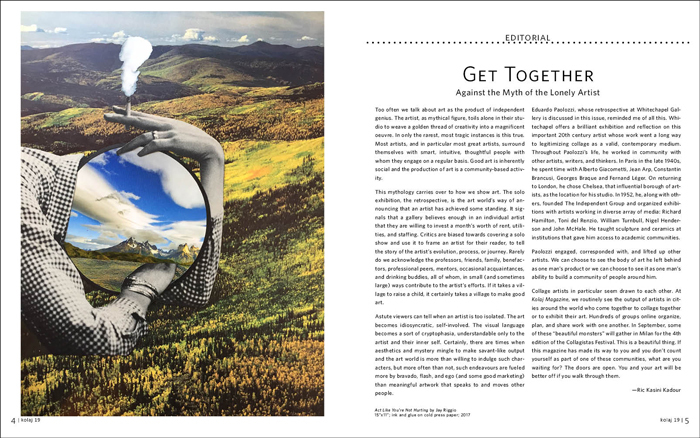 Collage artists in particular seem drawn to each other. 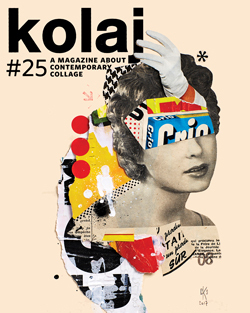 At Kolaj Magazine, we routinely see the output of artists in cities around the world who come together to collage together or to exhibit their art. Hundreds of groups online organize, plan, and share work with one another. In September, some of these “beautiful monsters” will gather in Milan for the 4th edition of the Collagistas Festival. This is a beautiful thing. If this magazine has made its way to you and you don’t count yourself as part of one of these communities, what are you waiting for? The doors are open. You and your art will be better off if you walk through them.